The Short-eared Dog (Atelocynus microtis) is the only remaining species of the genus Atelocynus, and can be found in the Amazonian basin of South America. It is also known as cachorro-do-mato-de-orelha-curta (Portuguese), nomensarixi (Chiquitano), ualaca (Yucuna) and zorro de oreja corto (Spanish). The Short-eared Dog has adapted to live in tropical rain forest environments, far away from areas with human settlements. This kind of environment contains a surprising variety of terrain, such as bamboo stands, swamp forest, terra firma forrest, cloud forest, and Selva Amazonica (moist broadleaf forest). Short-eared Dogs have partially webbed feet, which could be related to living in such a wet environment. It is mostly carnivorous, living on a diet of fish, crustaceans, amphibians, small mammals, and insects. Studies made of specific dogs' diet yielded evidence of fruit and plant consumption, but for the most part they eat meat. Female Short-eared Dogs are roughly 1/3 larger than males, but little is known about their mating habits, gestation period, litter size, or lifespan, though it is likely that they reach sexual maturity at one year. 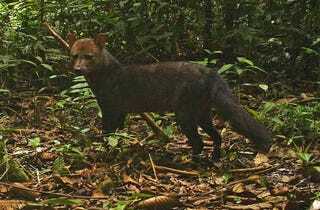 The Short-eared Dog is listed as Near Threatened by the IUCN. It faces significant threat from feral and domestic dogs, since they transmit diseases such as distemper and rabies to the isolated populations. And of course, like always, they suffer from loss of habitat due to deforestation.